Patent or Transfer Gold for outdoor and flat oil gilding projects. Leaf measures 3 3/8" x 3 3/8". One book (25 leaves) covers just under 2 sqft. while a pack (20 books, 500 leaves) covers just under 40 sqft. Please Note: the picture does not represent the actual leaf color. Q: What is the difference between "Patent Transfer Leaf" and regular Gold Leaf? The thing I want to know is if this is real gold or not and why does it say patent transfer? A: The patent refers to the wax paper backing that is loosely adhered to the back of the gold leaf. 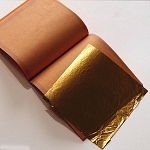 This type of gold is also known as transfer gold, because the gold is picked up by the wax paper, placed gold side down onto the adhesive and then the wax paper backing is peeled away. This makes gilding easy and is an imperative, if the gold is used in the windy outdoors. The other gold is known as surface gold and does not have the wax paper backing. This loose gold needs to be picked up and transferred to the surface with gilding tip. Both are genuine gold leaf.